When it comes to enjoying your favorite tunes at the beach, the mixing of water and traditional electronics can result in dangerous or disappointing circumstances. That is why it is extremely important to only bring the best sound gear on your waterfront excursions. This means a speaker that can hold up against the wind and the waves, while still packing a powerful punch to pleasure your ears. In this review, we will take a look at three of the top speakers available to purchase that can help you bring the party to your next beachside adventure. We will walk you through each one’s benefits, as well as a few drawbacks, so that you can make the best decision for your beach speaker purchase. 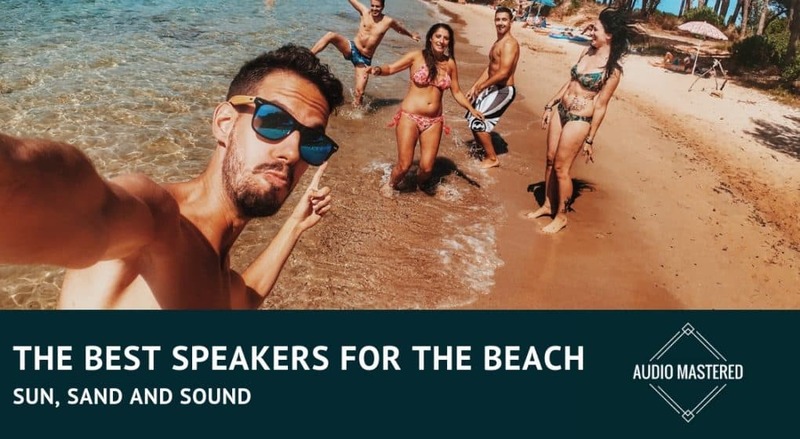 But before we get to the reviews I should mention a few important concepts you should be keeping in mind for beach speakers. The major decision point you need to make is how much waterproofing you’re going to need. It basically comes down to one decision: do you want to pay more for a speaker you can bring in the water? Keep in mind, it’s difficult to find a speaker that can be fully submerged for over 30 minutes without it dying. However, if the speaker has a waterproof rating of IPX7 (the X can be replaced by a number – essentially the dust proof rating, more on this below) then the speaker is capable of withstanding water immersion between 15 cm and 1 meter for 30 minutes. 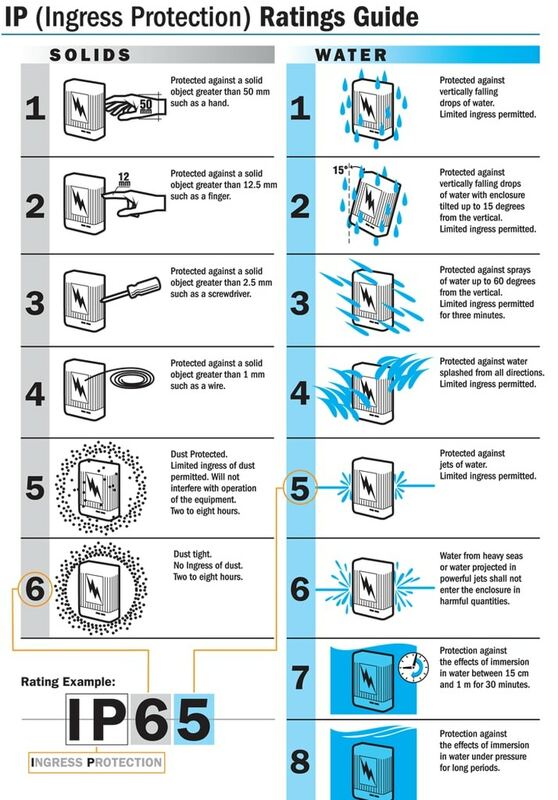 The price difference between each stage of waterproofing can turn the average consumer off. But if you’re looking for the best waterproof speaker I’d recommend one of my favorite overall speakers from JBL. The sound is fantastic and it’s incredibly durable. One often overlooked aspect of a speaker is the dust proofing. This is measured on a similar scale as waterproofing and often can be found on the same label. For example, a speaker with complete dust protect will have an IP rating of IP6X (where the X is the waterproofing.) See the chart below for a complete explanation. I’d almost go as far as saying the dust proofing is more important than the water proofing. As long as you don’t need to float with your speaker on the water chances are your speaker will remain dry. It’s a completely different story when it comes to dust. Fine dust particles are easily transported through wind. Try to remember the last time you were at a beach and it was completely calm. While the dust particles aren’t as troublesome to the electronics as water they can still do a lot of damage over time. If you’re a regular beach goer who wants a speaker to last more than one season I highly recommend you buy a speaker with an dust rating of 6. I find the general public is becoming more savoy with the specs on Bluetooth speakers. They’ve been around for a few years and people are getting a sense of their capabilities. Still, companies are continually pushing the boundaries on battery life and sound quality so it’s good to review what makes a “decent” Bluetooth speaker. Personally, I wouldn’t purchase a speaker that didn’t have at least 10 hours of use at 50% volume. This is the absolute minimum. These days, some speakers are pushing the 25-30 hours of playback at 50% volume. The next thing I’d be looking for is passive radiators. Just know, these are usually found on speakers in the $100 and up price range. The reason I like passive radiators is they provide a much more full bass experience. I was shocked when I heard how much bass a small Bluetooth speaker can produce with passive radiators. I find this is the biggest determinant of a quality soundscape with Bluetooth speakers. It’s easy to cover the high end of the frequency spectrum in small packages, but the low end is an entirely different story. So remember, if you’re able to afford it, 10+ battery life and passive radiators are great rules of thumb for any quality Bluetooth speaker. If you’re interested in other outdoor speakers check out my article here. 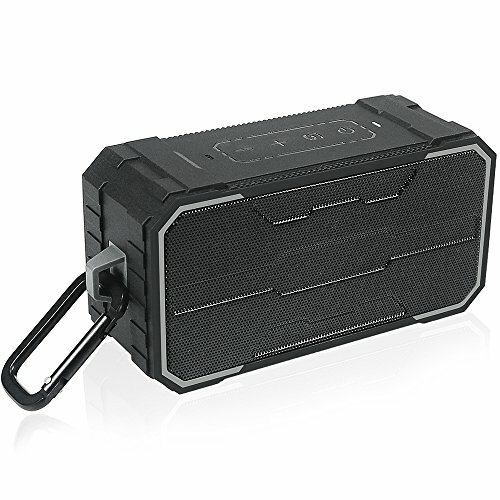 【Multiple Connection Way】 -- the Wireless Outdoor Bluetooth Speaker support Wireless Bluetooth, SD/TF card insert and AUX input for non-Bluetooth devices. 【Bluetooth 4.2 Technology】 -- Equipped with advanced technology and compatible with all Bluetooth-enabled devices. Speaker would automatically reconnect to the last device used. Our first pick is the waterproof, anti-drop, and durability tested Zosam Portable Bluetooth Speaker. In terms of value for your money, this device speaks volumes. With all the qualities that you want in a basic, beach-bound speaker, it’s hard to find a better deal at such a low price point. The Bluetooth connectivity means you can easily pair it with all of your favorite devices, whether that is your phone, laptop, tablet, or even a Bluetooth enabled car stereo. Don’t have Bluetooth? No worries! A standard 3.5mm auxiliary cable port allows for traditional wired connections. This comes in handy if you are playing from older devices. As a third option, this speaker also has an SD/TF card slot for the use of a playing files from a memory card. Once you are connected, get ready to enjoy the full-bodied sound quality of the dual driver stereo. With HiFi and 10W sound, it effortlessly plays any genre of music you may listen to. In addition to being a great portable speaker, it is constructed to hold up through most adverse conditions. It is built to an IPX6 standard, which means it is protected against powerful water jets. 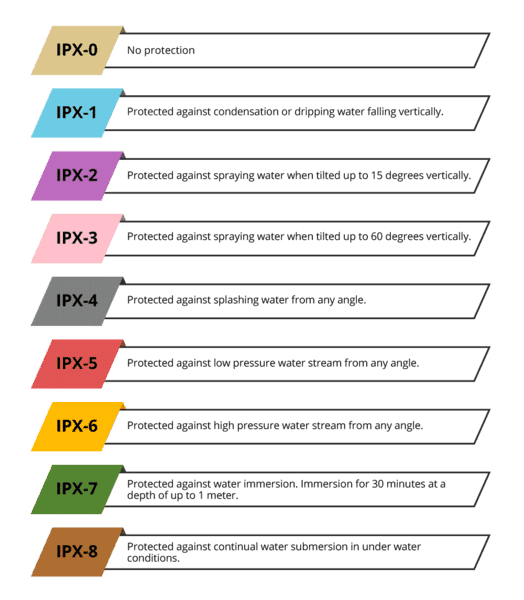 In terms of being “waterproof,” IPX6 is one step away from being considered fully waterproof, meaning it can handle everything up to, but not including, full submersion. The durable rubber and iron shell protect the speaker from bumps, drops, scrapes, and the like. Combine this with the high capacity, 2200mAh battery and you can enjoy up to 10 hours of non-stop music at your favorite waterfront. Plug in and recharge and you can enjoy this experience day after day. Its compact size and included carry strap make it easy and convenient to bring along or pack with other beach essentials. All in all, purchasing this speaker stretches your dollar and provides you with a quality product that doesn’t break the bank. [PROFESSIONAL ACOUSTIC DESIGN]. BUGANI portable Bluetooth speaker has Two woofers, Two tweeters and Two dual-power diaphragms (passive speakers). 80Hz~18000Hz frequency response makes it become great Bluetooth speaker. [POWERFUL BASS]. Thanks to 2 dual-power diaphragms and 30W rated power, BUGANI portable Bluetooth speaker has superb bass and plenty of volume, which are suitable for home party or outdoor travel. Now that we have introduced the best affordable “base” package for speakers you can take to the beach, we are going to dive into a next level beach worthy speaker. The Bugani M83 takes things up a notch with a few extra goodies to sweeten the deal. First, let’s talk about the sound. In an upgrade from our last recommendation, the Bugani M83 brings two subwoofers, two tweeters, and two passive diaphragm speakers. This all adds up to bringing you a professional acoustic sound as well as a powerful and clear bass. With 30w of output, you’ll get loud and satisfying music ability that carries across the waves. For double the fun and the sound, this Bugani speaker features a unique pairing function that allows you to play the same song on two separate Bugani speakers. Playing the same song simultaneously creates that craved surround sound effect. In addition to the superior sound quality, these speakers can outlast virtually any beach party you throw at it. The 4000mAh built-in rechargeable 7.4V battery brings you up to 20 hours of non- stop music when played at a volume of 50%. As an added bonus, the Bugani M83 includes an integrated charging station that will allow your phone to charge at the same time as playing your tunes. This means no more depleted phone battery due to you having the best playlist at the party! Bluetooth connectivity or a 3.5mm auxiliary cable port. No device? Simply put your files on an SD memory card and insert directly into the speaker. Then use the simple and intuitive controls to navigate your songs. Most importantly for a day out in the sun and the sand, the Bugani M83 is built to be tough. Boasting an IPX5 rating, this speaker can withstand water exposure from any direction, only susceptible to damage if someone decides to take it on with a pressure washer. 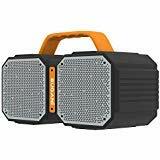 Not only does it have a great look that resembles the popular old school boom box, it is also built with a shock absorbing and drop resistant metal frame and durable rubber coverings. Our last pick is for those who can have only the best, regardless the cost. The higher price is not without cause, however, as this VAVA speaker brings together the best combination of superior sound quality and ultimate portability. This small speaker packs a big sound and lets you bring the life of the party in the palm of your hand. An attractive and sleek looking triangular prism design allows for the speaker to set in a variety of ways. This includes sitting flat on a table on any one of its three sides, floating effortlessly in the water, or standing upright in a cup holder with no problem. You can bring the VAVA sound with you thanks to the two quality speakers and two end facing passive subwoofers. Enjoy all your favorite music and pulsating bass in loud and clear fashion. 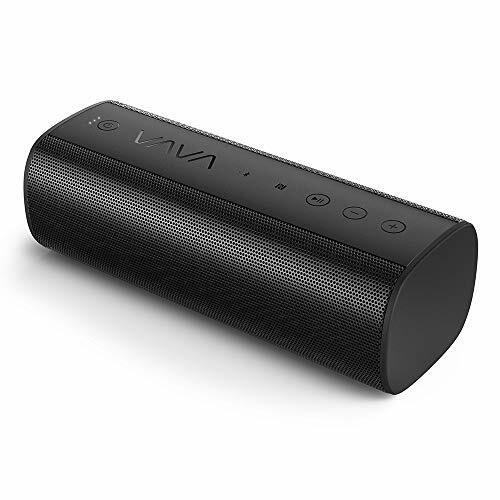 In addition to the sound quality you expect, this VAVA speaker offers the extra features and great construction that every beach speaker needs to have. With simple and easy Bluetooth pairing, you can listen from any Bluetooth enabled device, as well as make hands free phone calls using the built-in microphone. In the case of older devices, a 3.5 mm auxiliary cable connection is also available, supporting A2DP, AVRCP, HSP, and HFP. Thanks to the IPX5 splash proof rating, you’ll be able to take this speaker with you in the water without worrying about ruining the device. Dust, sand, and rain are also taken in stride with this tough and durable speaker. A 5200 mAh battery provides you with 24 hours of non-stop playtime and party beats. While it does come with a higher price tag, this speaker is a great way for those who can to spoil their ears with high-quality sound without the burden of hauling large speakers to the beach. Now that you have an idea of what each of these products has to offer, you can make the most of your days of fun in the sun. So, whether your style is a sun-soaked chair setting a few feet from the water’s edge, or a swimming and floating in the deep blue, these speakers allow you to bring your sounds along. The best option for you will depend on your specific preferences as well as what you are willing to spend, but one thing is for sure. From party bumping and fist pumping tunes to laid back and relaxing rhythms, you’ll be able to enjoy your music wherever you go.